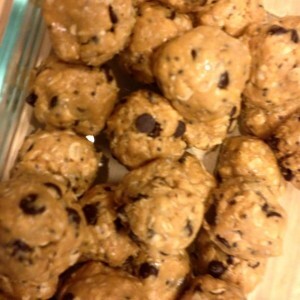 I Love making these delicious Shaklee protein balls! The only problem is that they are hard to keep in the house! There are many variations but one of my favorite recipes is what I will share here. I am making these tomorrow night for my big Italian night Shaklee business launch in my new town! I am so excited about it! 1/2 cup Shaklee protein of your choice – I like to use the new Life Shake protein in vanilla. Life Shake has probiotics for digestive and immune health as well as omegas which are great for brain and heart health! Life Shake is part of the new Life Plan, which is the best most comprehensive nutritional program in the world, backed by decades of science! Mix well and roll into balls. Refrigerate to set and ENJOY!!!! The key is having the right proportion of wet ingredients to dry. So you may need to add a little more of your peanut butter or honey if it’s too dry. Note: I choose Shaklee protein because it is such a good choice. Shaklee uses non-GMO ingredients and all of Shaklee products go through stringent testing to make sure it is free of anything harmful to you or the environment. Shaklee protein is unique because it uses a water wash (verses a cheaper alcohol wash) to isolate the soy bean so you are still getting all of the goodness and nutrition from the soy bean without any risk of contamination or losing nutrient value. Shaklee never uses any artificial ANYthing so it’s really a good choice. And tastes great too! I have a Shaklee protein shake every morning and have for the last 4 years! Never get tired of it. What are your favorite healthy go-to snacks for your family? This entry was posted in Recipes, Shaklee. Yum! I love these. They don’t last long in our house either!